Take a local train of JR “Biwako Line (Tokaido Line),” get off at “Seta” station (ca. 17 minutes from “Kyoto” station). 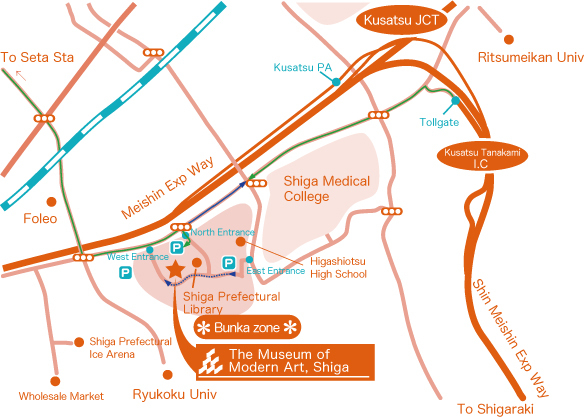 Take a bus for “Shiga Medical College (Shiga Idai),” get off at “Bunka Zone mae” stop. Ca. 5 minutes by foot from the stop to the museum. Ca. 5 minutes from “Kusatsu Tanakami” interchange of “Meishin” or “Shin-meishin” expressway. – Public transportation is recommended from the ecological viewpoint. – If you take taxi please come into the “Biwako Cultural Park (Bunka Zone)” via east gate.